Jaishri Abichandani was born in 1969 in Bombay, India and immigrated to New York City in 1984. She received her MFA from Goldsmiths College, University of London, and then founded the South Asian Women’s Creative Collective (http://www.sawcc.org) in New York (1997) and London (2004). 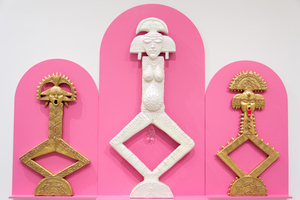 Abichandani has exhibited her work internationally at places such as MoMA PS1, the Queens Museum, the IVAM Valencia, House of World Cultures in Berlin, and the Guangzhou Triennial. Jaishri served as the Founding Director of Public Events and Projects from 2003-2006 at the Queens Museum of Art, setting its current trajectory for community engagement. She organized exhibitions such as ‘Fatal Love: South Asian American Art Now’, ‘Queens International 2006: Everything All at Once’ and curated ‘Her Stories: Fifteen Years of SAWCC’. Abichandani has curated a trilogy of feminist science fiction based exhibitions at Rossi and Rossi in London along with several other projects. 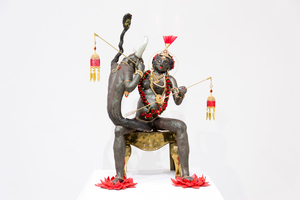 Abichandani‘s work is in the Burger Collection and the Asia Art Archive Collection. She has been a resident of LMCC’s Process Space residency and honored by the Brooklyn Arts Council.